This holiday offers an affordable way of tracking chimps and severely endangered mountain gorillas in Uganda & viewing the superb wildlife of Murchison Falls National Park. Travel in a rugged overland truck by day and sleep in simple rest camps at night. 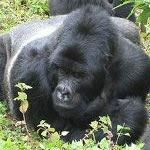 English speaking guide, activity package, park fees, chimp & gorilla permits included. Group size 4 to 18. This morning you will be collected from your hotel in Kampala and transferred to the departure point for your exciting adventure tour, travelling in a rugged 4x4 overland truck.